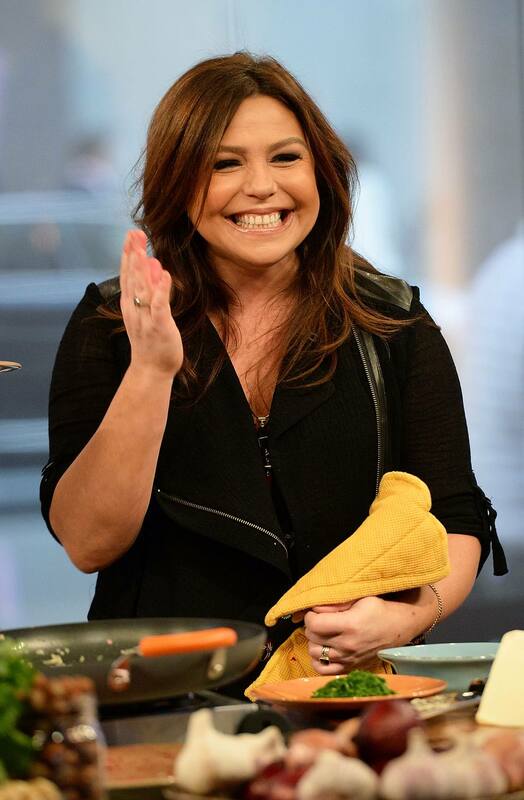 Rachael Ray has a love her or hate her kind of personality. Millions adore her quirkiness and down-to-earth style. Others, including many celebrity chefs and food writers, heap criticism upon her. Entire blogs are devoted to slamming the self-proclaimed Anti-Martha Stewart. It’s easy to dismiss Rachael as an amateur chef. She uses boxed ingredients, she hates specialty foods in recipes, her food often has silly nicknames, and she uses abbreviations like EVOO for extra-virgin olive oil. She giggles when she cooks and makes juvenile comments. What her critics don’t understand is that Rachael is entertaining and that’s what people want. There are dozens of cooking shows on television. If people only wanted to know a recipe, they could buy a book. People love Rachael because of her engaging personality, her recipes fit the American lifestyle – cheap and easy, and most importantly, Rachael Ray is someone they can relate to. Rachael says she was born into cooking. "My first vivid memory is watching mom in a restaurant kitchen. She was flipping something with a spatula. I tried to copy her and ended up grilling my right thumb! I was three or four," says Rachael. “Everyone on both sides of my family cooks." Rachael's professional career started at Macy's Marketplace in New York at the candy counter. She was then promoted to manager of the fresh foods department. After Macy's, Rachael was involved with opening Agata & Valentina, the celebrated New York gourmet market, where she was the store manager and buyer. Although she enjoyed her career in the city, Rachael wanted to return the lifestyle she knew in the Adirondacks. Once upstate, Rachael managed pubs and restaurants at the famed Sagamore Resort on Lake George and was then recruited by Cowan & Lobel, a large gourmet market in Albany, to be its food buyer. As a way to increase sales during the holidays, Rachael began a series of cooking classes, 30-Minute Meals. The classes became so popular they were covered by the local news. The next week, an Albany TV station asked Rachael to do a weekly 30 Minute Meals segment for the evening news. Nominated for two regional Emmys, the show was a major success. The show is now carried by the Food Network. 30-Minute Meals is definitely not gourmet and probably makes people like Martha Stewart cringe. Rachael cuts corners and uses boxed ingredients. She abhors specialty ingredients. Her dishes only use what she can find at the local supermarket. She has received a lot of bad press for this, from the media as well as chefs. In Rachael’s defense, this is the reality for most Americans. As much as we’d like to whip up a gourmet meal every night, we simply don’t have the time. Between work, picking up the kids from school, soccer practice, violin lessons, softball, chores around the house, and everything else we do, it’s a miracle we have time to eat food, let alone prepare it ourselves. Having fast, easy to prepare meals at least gives families more time to spend together at the dinner table. So, yes I do prefer to make everything myself using only whole foods, but that’s not always reality. To Rachael’s critics, I say there are more important things than food. Don’t be a snob. Other Food Network shows with Rachael Ray include $40 a Day, how to enjoy gourmet food on a limited budget, no matter where you travel. Inside Dish takes Rachael into the home and kitchens of American’s biggest celebrities. Rachael Ray’s Tasty Travels has Rachael sharing insider tips and travel secrets that will make your next vacation the tastiest yet. Rachael has signed a deal with Oprah Winfrey's production company to host a daytime syndicated talk show targeted to launch in fall 2006. After Dr. Phil, Ray will become only the second personality that Winfrey will develop on her own talk show. Ray has appeared on The Oprah Winfrey Show in the past, but her appearances will now become more frequent. Will Rachael be Oprah’s replacement when she retires? In Oprah-like fashion, Rachael has launched her own magazine, Rachael Ray Magazine. Published bimonthly, Rachael shares cooking tips, shopping advice, and recipes. Get to Know Chef Susanna Foo, the Innovator of Asian Fusion Cuisine!